Recent analysis by Synapse (click here) shows that if states act early and pursue strong levels of energy efficiency, they can not only meet the Clean Power Plan emission targets, but will also secure a lower-cost electric system. Our analysis shows that by not implementing the Clean Power Plan, the cost of the electric system could increase by $79 billion between 2020 and 2030. Without the Clean Power Plan, these costs will be added to electric customers’ bills and the opportunity for significant savings will be lost. 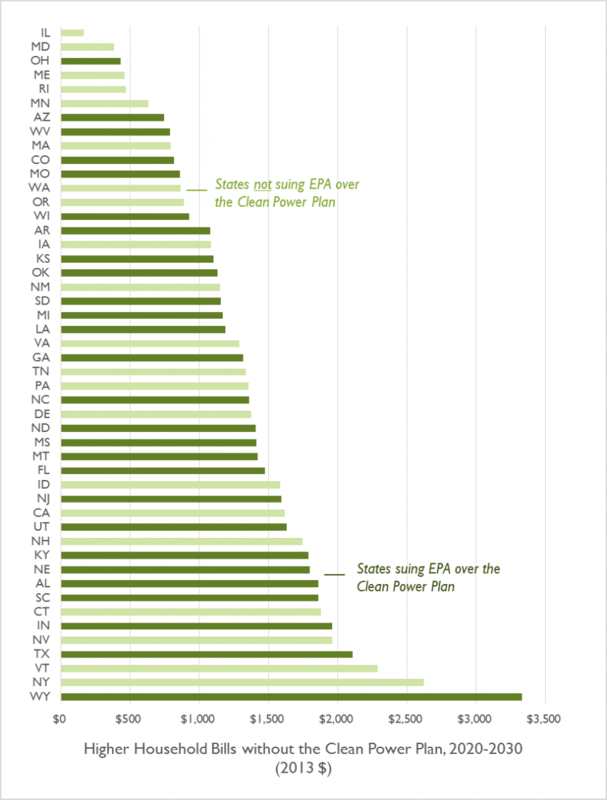 If the Clean Power Plan is not implemented, the typical residential customer in the United States can expect to lose over $1,300 between 2020 and 2030, with customers in the 27 states currently suing EPA over the Clean Power Plan standing to lose $1,400 without the Clean Power Plan (see Figure 1, below).